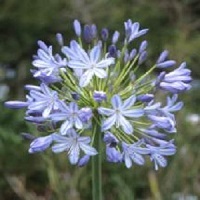 Agapanthus are popular summer flowering garden plants with star-burst flowerheads in white to the darkest blue. They are well suited to warmer UK gardens and grow well in borders and containers. They come from South Africa originally and have naturalised in some parts of the UK, most particularly in the Isles of Scilly. 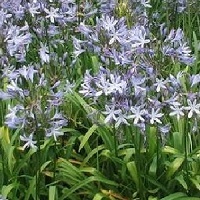 Most of us buy our Agapanthus as plants, but they can be raised from seed, with a little patience. 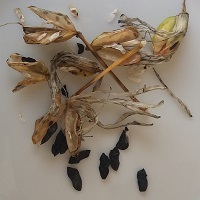 I collected seed today from one my dwarf Agapanthus and will sow them this autumn. 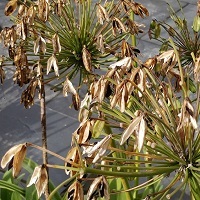 Agapanthus seedheads mature in autumn when the seeds can be collected for sowing. This is typically October/November in Cornwall, but watch your plants to see the pods ripening from green to pale brown and then starting to open. The seeds are black and 'papery' in nature and quite delicate, so be careful when handling them. The seeds do not store that long, so sow immediately in autumn or keep them in a dry sealed container in a fridge and sow the seeds the following spring. 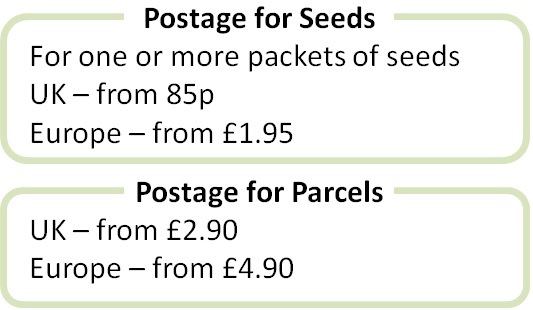 Keep sown seeds at a cool 15-18 degrees Celsius and they germinate in 4-6 weeks. 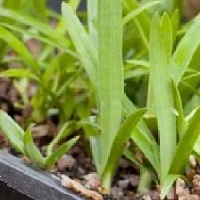 The seedlings take a white to get established, and will grow into clumps that generally start to flower in the third season. They are worth the wait, as Agapanthus plants hybridise easily with one another and you may get the occasional unexpected plants with a new flower colour or form. Plants generally flower from June to August, but they do vary depending on the species and varities. 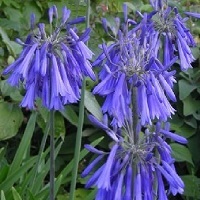 Good plants to try from seed include Codd's Agapanthus, a hardy deciduous form, growing up to 1m high, wth pale blue and striped flowers, the Drooping Agapanthus, another deciduous plant, with bright blue flowers, up to 120cm high, and Agapanthus 'Adelaide', a hardy evergreen dwarf plant with masses of pale blue flowers up to 80cm in height.